This program offers a warm, safe and friendly home-like environment that is designed, with your help, to meet your child’s physical and emotional needs. Individual routines are the curriculum for an infant’s day. 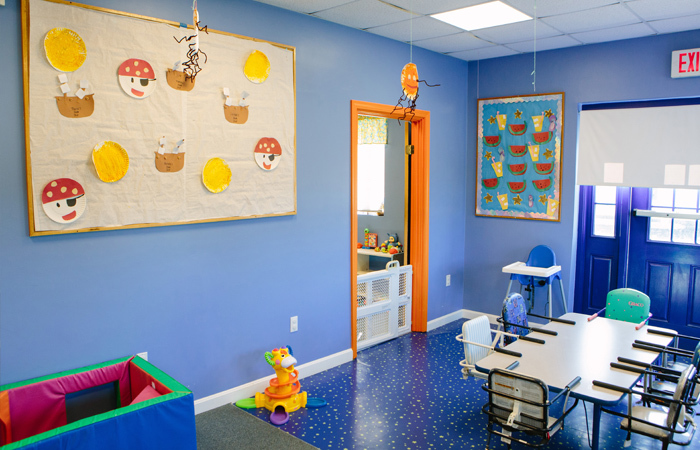 Throughout the day our staff will provide your child with comfort, sleep, nourishment and one on one interaction. 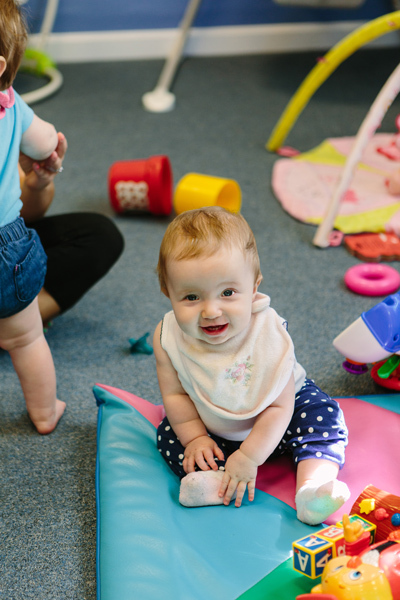 Your child will also develop his/her language, cognitive, and small/large motor skills while interacting with our staff and exploring his/her environment. 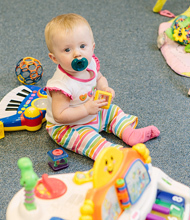 This program combines our infant program with our toddler program, set at your child’s pace. 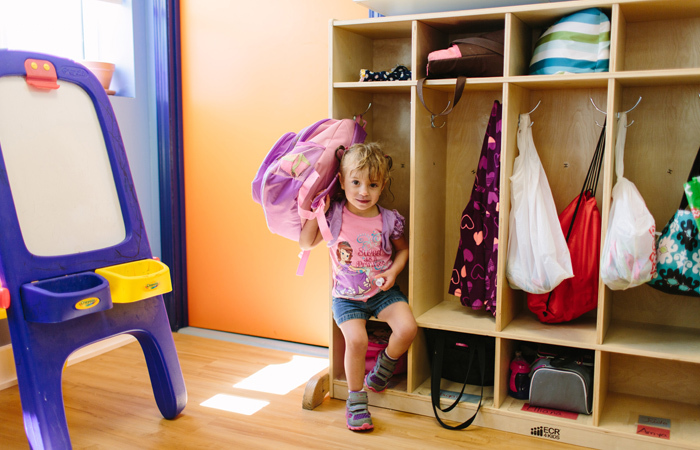 We help your child move away from his/her infant routine into a toddler program. 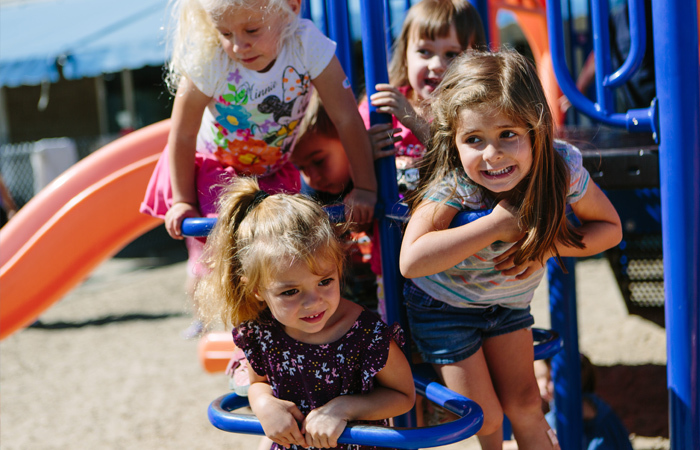 This program is a perfect balance between nurturing, playtime and learning. This program offers hands on experiences and an age appropriate curriculum that help your child develop confidence, self-esteem and a love for learning. 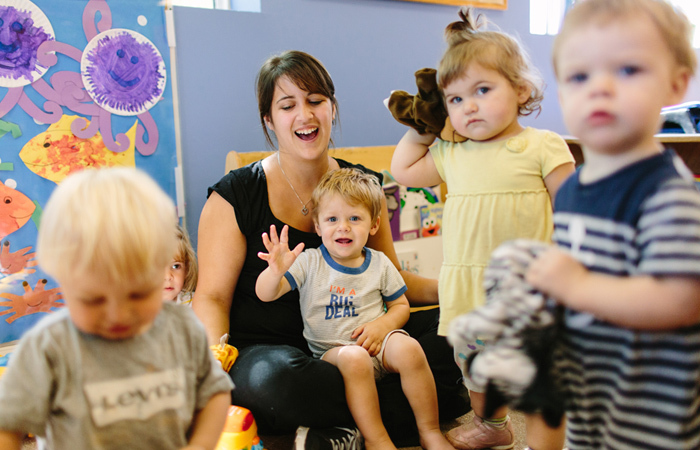 Our staff supports your toddler in growing socially and emotionally, while helping him/her begin to learn about the world around him/her and nurturing his/her individual creativity. Each day is filled with fun activities that help toddlers develop both socially and cognitively. 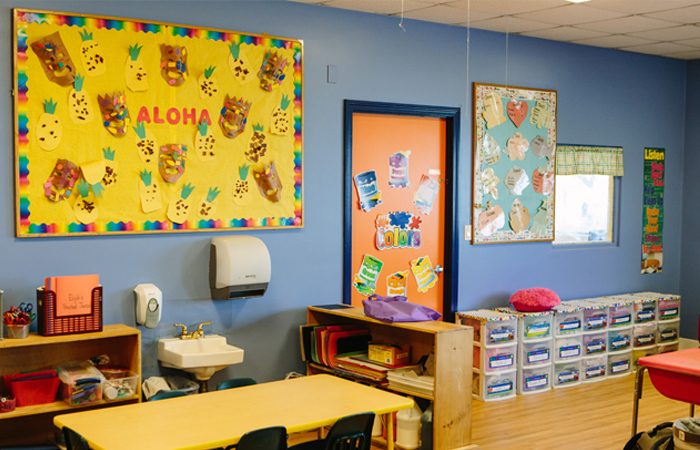 The Preschool/Pre-K classrooms are designed to help your child become part of a learning community, where they not only build skills vital to success in Kindergarten, but also respect for others. This program enhances the confidence of preschoolers by providing them with activities that focus on cognitive development, social and emotional development, language development, large and fine motor skill development, as well as creative expression. 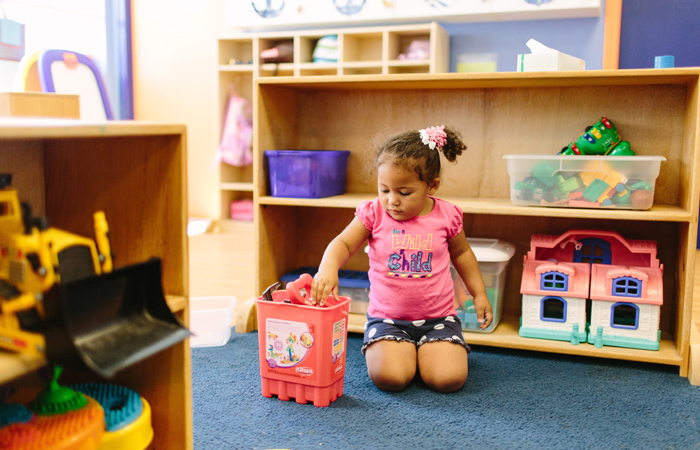 Recognizing that your preschooler needs to be engaged and nurtured at the same time, our teachers give them both the freedom and the instruction they crave. The children are introduced to a balanced program of interaction with friends in both teacher-directed and child-directed experiences. 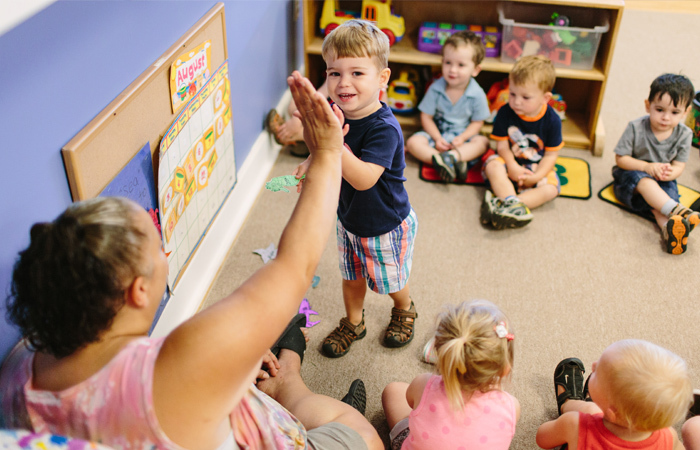 The daily schedule includes: free choice of time spent in the learning centers, group times, creative movement, music, storytelling, and dramatization. Field trips are also part of the children’s experiences. The program we pursue is geared toward helping children develop habits of observation, questioning and listening. It gives each child an awareness of one’s own feelings and of one’s right to express those feelings, sometimes channeling them into more appropriate means of expression. The children learn they are free to make choices as long as they stay within the limits of consideration for other people and things. Children are treasured for their uniqueness and individuality. Such an open-minded program prepares children to utilize their intellectual and creative abilities for future learning tasks. 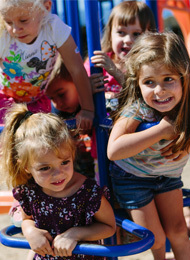 Our program is child-centered and based upon the belief that play is the best way for children to learn. 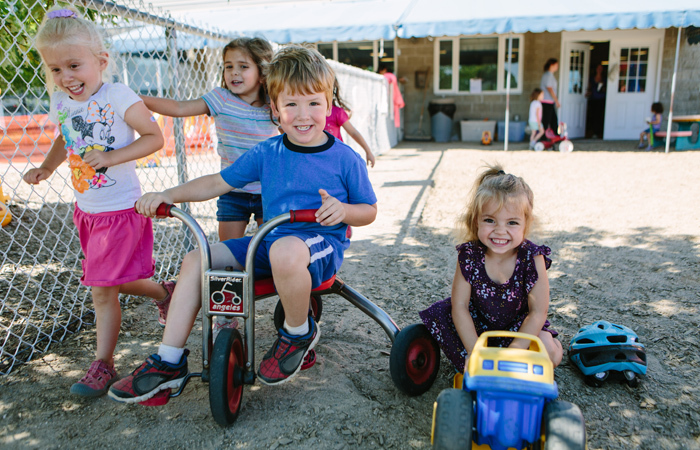 Our approach is individualized to meet each child’s needs and interests. Our curriculum is planned on a weekly basis for each group and is appropriate for the age span of the children in the group. 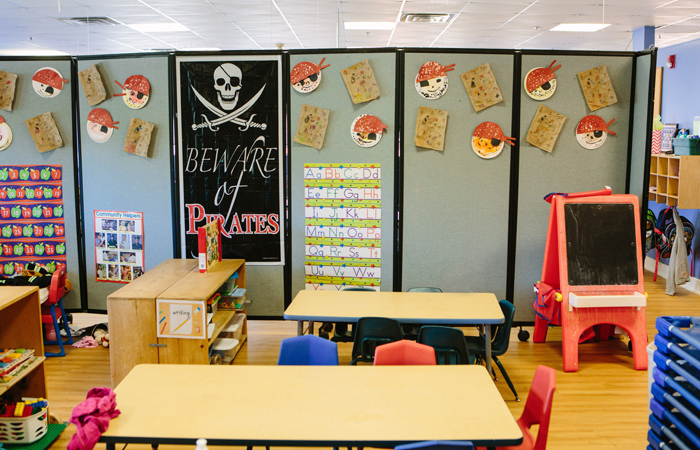 Each classroom is organized with centers for creative art, literature, science and pre-math, dramatic play, and cognitive and small motor development. Our curriculum is integrated throughout the classroom. Our themes are introduced through stories and carried through our art projects, games, songs, and play. The environment is planned to stimulate imagination and creativity, socialization, exploration and discovery, while challenging the use of muscles important to developing bodies. Generally our teachers begin this group time with a specific topic for discussion. It may be a topic related to a project the class is working on, or it may focus on a specific skill. For example, in the beginning of the year, the teacher may play games to help the children learn the names of each of their classmates. Children may also use the time for “show and tell.” Teachers often also include music appreciation, group sings, and creative movement during circle time. What’s Learned: These “chats” are an opportunity for the youngsters to learn how to organize their thoughts. As they talk about their experiences, children learn how to tell a story with a beginning, middle, and end. Children enjoy both listening to music and making their own. Whether it’s a group sing-along, marching in a percussion band, playing a triangle, or making up new lyrics to old favorite tunes, music is the universal language. Creative movement, learning to move your body through space, in time to the music or while pretending to be a falling leaf, is a creative way to tap into a child’s imagination and artistic side. What’s Learned Music helps children connect the outer world of movement and sound with the inner world of feelings and observations. Children learn music the same way they learn language–by listening and imitating. Listening to music also teaches important pre-reading skills. Some art projects are part of a theme that the class is studying. Our art corner is stocked with materials that can be used in a variety of ways for projects. There are easels for painting individually (although sometimes two children will work at the same easel to create a painting together). What’s Learned A good art project teaches a child that his creativity is limited only by his own imagination. By transforming everyday objects, such as empty paper towel rolls and egg cartons into sculptures, imaginary bugs, or spyglasses, a child discovers that he can create a world of play. The process, not the product, is the most important element of art projects. 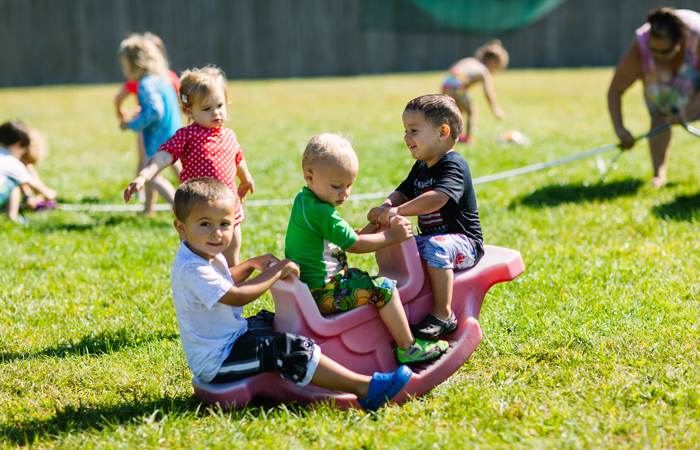 Running, swinging, climbing, jumping, hopping, biking, digging in the sand–outdoor fun is one of the favorite parts of any young child’s day. 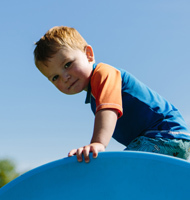 Our playgrounds have space and sturdy equipment that allow a child to use his imagination while exercising. What’s Learned Outdoor play refines a child’s gross-motor (large-muscle) skills. The cross-lateral movement (right arm/left leg and vice versa) involved is critical to a child’s later success in reading and writing. Playground time is also an opportunity to explore and manipulate a different environment. Youngsters also love outdoor play because they can let loose their imaginations while getting physical. They can turn the jungle gym into a rocket ship, a castle, a firehouse–anything they choose. Children enjoy cooking. Sometimes they like the product, but even if they don’t, they always appreciate the process. It’s fun to do something that is a grown-up activity–and discover that kids can do it too! What’s Learned Since cooking is a basic life skill, it fosters a child’s sense of competence and independence when he can do it. Math skills are also an important part of the process as the cook needs to count and measure the ingredients. Cooking also refines small-motor skills as a child stirs, dices, and adds ingredients. It also teaches about nutrition-foods that are good for you and help you grow. Free play sounds vague, but is very much a planned activity. The child has the freedom to choose among many different activities, but the teacher has created the classroom environment and arranged the choices. Free play is not time off for the teacher. On the contrary, our teachers are paying close attention to the children, interacting with them, offering guidance and help where necessary, noting progress and difficulties. Here are some of the activities that a child may choose during the free-play period. Building with blocks is lots of fun–and it teaches many skills that children will use later. One study indicates that many of the concepts learned from block building are the foundation for more advanced science comprehension. For example, a child learns about gravity, stability, weight, balance, and systems from building with blocks. What’s Learned Blocks help children learn scientific, mathematical, art, social studies, and language concepts; use small-motor skills; and foster competence and self-esteem. Building with blocks also teaches life skills. Finally, building with blocks fosters a feeling of competence, teaches cooperation and respect for the work of others, and encourages autonomy and initiative. The housekeeping/dress-up corner is stocked with play items and props that encourage young children to play make-believe. What’s Learned Playing make-believe lets a child bring the complicated grown-up world down to size. Research demonstrates that children who are active in pretend play are usually more joyful and cooperative, more willing to share and take turns, and have larger vocabularies than children who are less imaginative. Imaginative play helps youngsters to concentrate, to be attentive, and to use self-control. 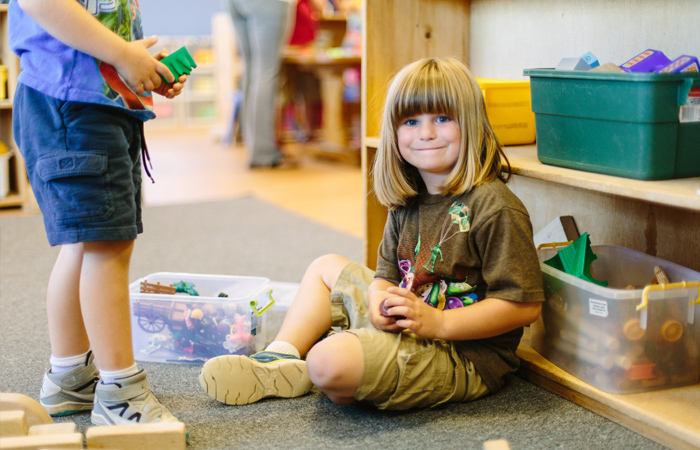 Through imaginative play, children learn empathy for others. Dramatic play encourages children to think abstractly, which is an important pre-reading skill. Children enjoy playing with a variety of toys that helps develop their fine-motor control. These toys include Legos, Bristle Blocks, Play-Doh, Peg-Boards, large beads to thread, and stacking and nesting materials. What’s Learned Manipulative toys help develop a child’s fine-motor skills, which is a precursor to being able to write. 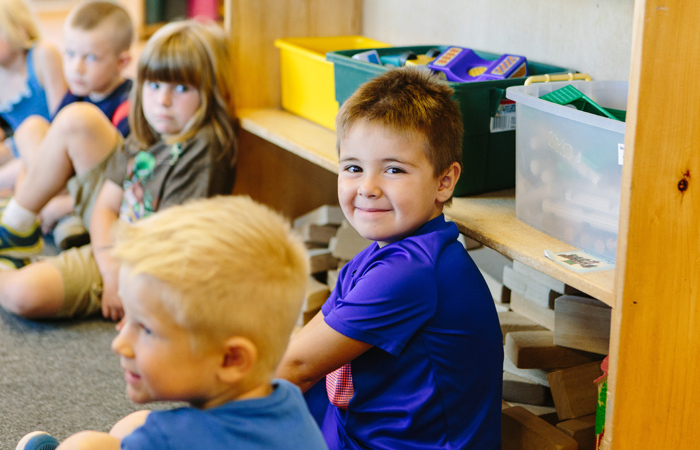 During the day, you’ll see children who are playing by themselves, but you’ll also see cooperative play, small groups or even the class as a whole working on a project. The amount of cooperative play increases as the children grow older. Some of this play may be child initiated, and some may be teacher directed. What’s Learned Working together, whether it’s on a block building or planning a tea party, helps children to learn to respect the ideas of others. 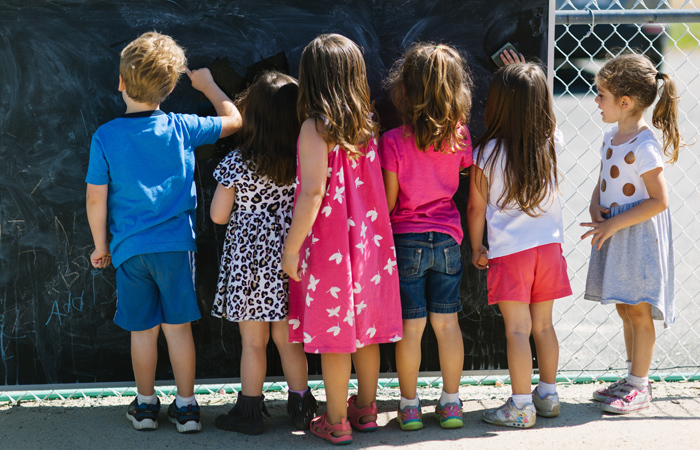 They develop their social skills, and social competence is an underlying goal of early childhood education. Children in cooperative play learn to contribute to joint efforts. They also learn how to problem solve by working together to find a solution. Sometimes the table is filled with sand, rice or beans. When it’s filled with water, the table becomes a doll bathtub or a sink for toy china. What’s Learned A child has a practical math lesson in fractions when she pours a cup full of sand into a two-cup container. It explains the concept faster and more clearly than a detailed discussion or drawing. Her fine-motor skills are also being developed as she washes a tea set or maneuvers a cup full of sand into a sifter. Her eye-hand coordination is helped. The classrooms have puzzles that vary in complexity, five-piece puzzles, as well as 12-piece puzzles, and puzzles made of different materials. What’s Learned Puzzles require abstract thinking: the ability to see a space and envision what belongs there. Puzzles also require fine-motor control in order to place the pieces into place. Having puzzles for varied skill levels permits children at all stages of development to experience success. Our book corner has books reflecting a range of levels. There are simple board books, as well as picture books with a story line. This is a place where children can go and look through books by himself–as well as a meeting place for story time for the class. What’s Learned Children learn language skills from books; whether they are looking at a book individually or being read to as part of a group. Children don’t yet know that grown-ups consider cleaning a nuisance. For them, it’s another fun activity. Allowing the young child to put away the blocks, wipe down the tables, and put the toys back on the shelves is a valuable educational exercise. What’s Learned Children learn to sort, classify, match, and organize when they put the toys back on the shelf. Children learn that helping behaviors and orderliness are valued. They see that it’s important to take care of their environment and that it’s easier to find what you want when you put it back in its designated place. Cleaning up teaches self-discipline. Children learn how to follow simple directions. Working together as a class to clean up their room is another exercise in cooperation. Children also enjoy feeling competent, independent, and responsible. With the instant feedback of a clean room and a job well done, a youngster’s self-esteem is enhanced.